These digitally measured and custom fit liners offer high walls and edge-to-edge fit for total coverage. Rain or snow, hot or cold, these liners can take it all without warping or cracking and come out looking like new. With channels more than three times deeper than other leading liner brands, Michelin EdgeLiners are built to contain slush, mud, and mess and keep away from your feet. Factory retention posts in your vehicle lock into these liners and hold them securely in place. Face it...your passengers can be messy, especially when they're kids. Our custom rear runners keep your truck looking new no matter who's been riding with you. Michelin EdgeLiners have an anti-slip nibbed backing for a second layer of security. Rest assured knowing your liners will be right where you left them. Michelin EdgeLiner uses an advanced and unique manufacturing system to create floor liners with unparalleled quality and functionality. Tougher, yet more flexible, material means the deep wells and channels used to catch and contain water, mud, and debris on the EdgeLiner are three times deeper and more effective than traditional custom floor liners. To hear more about our materials and design process, listen to our founder and CEO on Nerd Talk. Q: What's the difference between a truck liner and a floor mat? 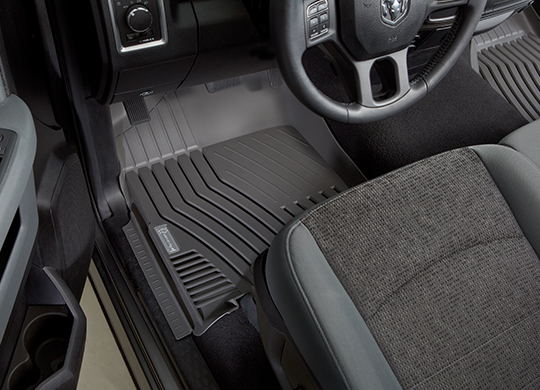 A: Floor liners are engineered to match a specific vehicle’s floor pan millimeter for millimeter. Most floor mats are universal fit, meaning they cover the floor of all vehicles relatively well but cannot provide total coverage or protection. Michelin EdgeLiner is a premium custom floor liner specifically designed for trucks and SUVs. Q: What makes Michelin EdgeLiner a premium product? A: Materials & Design. Michelin EdgeLiner is made with a unique rubber-like resin--not plastic like other liners--that allows for higher walls, deeper channels, and greater flexibility. And it means you can pull them out for a rinse without pouring the mess all over your carpet. Q: What is the warranty for Michelin EdgeLiners? A: Our liners come with a lifetime warranty and a Michelin-quality guarantee. Q: How will Michelin EdgeLiners perform in extreme temperatures? A: Unlike other rigid, plastic liners, Michelin EdgeLiners will never warp in summer heat or crack in winter cold.